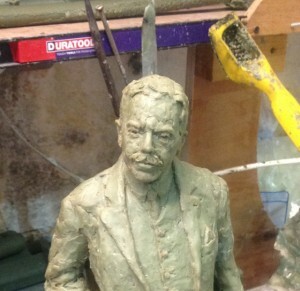 The clay maquette of Sir Nigel Gresley and the Mallard arrived safely in the Docklands at Bronze Age Sculpture Casting Foundry. Their team made the two moulds – one for the figure and one for the Mallard – and cast them in wax. Two weeks later I was presented with the wax version of the sculpture to check. There is always a need for me to do some minor tweaks at this stage. Additions are made in white wax. I use my wax tools to make other amendments. Time also to position the mallard duck. One of the Bronze Age team are always nearby to provide advice or assistance – and a welcome cup of coffee. 2 Responses to "The Gresley maquette – wax stage"
The sculpture is superb. I like your idea of sharing the clay maquette with us. Thanks for sharing.